MIKS World Cartoonist Annual Award 2017 "Golden Pencil Sharpener" is awarded by the International Association of Caricature MIKS for the best artistic achievements in the field of cartoons in the World. a. The Annual Award „Golden Pencil Sharpener“ is awarded to Best Cartoonists for the best artworks that have been released, exhibited, displayed over the past year. b. The Lifetime Achievement Award „Golden Pencil Sharpener“ is awarded to prominent world cartoonists who with their creativity marked the time in which they acted and whose creative journey was rounded off, and works and achievements remain a permanent good in the world of cartoons. c. The Cartoon Promotion Award „Golden Pencil Sharpener“ in the world is awarded to organizers of international exhibitions of cartoons, magazine and magazine publishers, journalists and all other individuals and associations that have contributed to the Cartoon Promotion Worldwide as a stimulus for further work in a better promotion of cartoons in the world . 3. The Cartoon Promotion Award in the world consists of plaques, diplomas and invitations to the jury of the International Cartoon Exhibition in Sisak (MIKS). Announcement of the winners 1. Awards will be held on June 29, 2018 during the opening of the 4th MIKS at the City Museum in Sisak (Croatia). The prizes will be awarded to winners by mail, together with a invitation to participate in the work of the International Jury of the MIKS Exhibition next year. The solo exhibitions of the winners of the " „Golden Pencil Sharpener“" award will be arranged in agreement with the laureates for next year 2019. The winners will be nominated and selected by the International Jury composed of 20 eminent world cartoonists, organizers of international exhibitions, editors of magazine cartoons and art historians from all over the world. 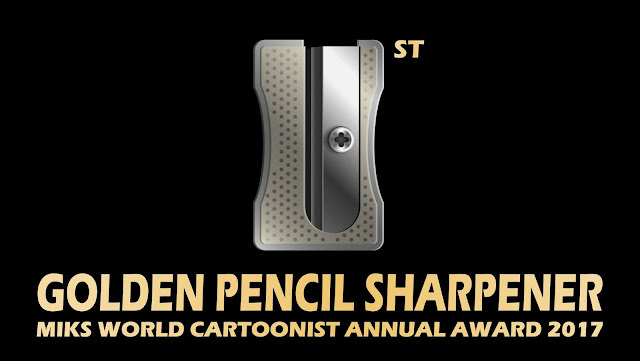 0 Response to "Golden Pencil Sharpener MIKS World Cartoonist Annual Award 2017"